The District Regeneration Framework was approved by the Council in April 2016 and work is underway to complete the implementation planning. Find out the latest news about Sauchiehall here. In addition to the key projects identified in the Framework, the District will also benefit from the Avenues project which is part of City Deal. 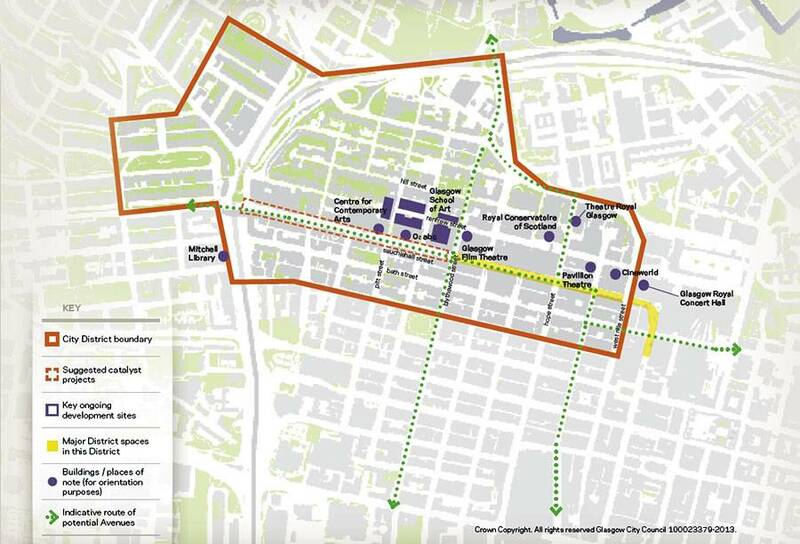 This means that Sauchiehall Street to Charing Cross as well as Renfrew Street to Killermont Street will be redeveloped. The arts and cultural institutions, including The Glasgow School of Art, Royal Conservatoire of Scotland, The Theatre Royal Glasgow, The Glasgow Film Theatre and the Centre for Contemporary Arts, The 0² ABC, the Pavilion Theatre, Cineworld and the Glasgow Royal Concert Hall. The west side of Sauchiehall Street has capitalised on its multifunctional night time economy and has evolved into a social entertainment destination. The west side of Sauchiehall Street also acts as a pivotal connector to Kelvingrove Art Gallery and the Mitchell Library. The developments will improve the connectivity of this District with the rest of the City Centre and the City generally which will benefit residents as well as visitors and businesses. The high number of entertainment and art venues and how close together they create unique opportunities to improve the pedestrian experience. This will ensure the District makes the most of all these things, particularly at night. Reducing the amount of the roadway given over to the car will reduce the impact that constant vehicle movement can have.